Welcome to my book blog! Where I try not embarrass myself by reviewing, reading and writing books. Do your little ones resist going to sleep? Lull them to sleep with a fun bedtime challenge in Don’t Close Your Eyes! Children have a lot of fun packed into a day, and they don't always want it to end. 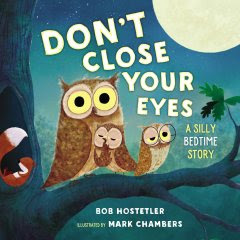 Award-winning author Bob Hostetler capitalizes on this by challenging little ones to keep their eyes open, no matter how heavy their eyelids may get. The soft rhymes about animals preparing for sleep will help them settle down until they finally close their eyes and sleep! With silly and adorable characters whose sleepy faces will make you laugh out loud, Don’t Close Your Eyes is a unique bedtime book that your child will reach for again and again. Get ready for bed and say your prayers, but whatever you do, don't close your eyes!